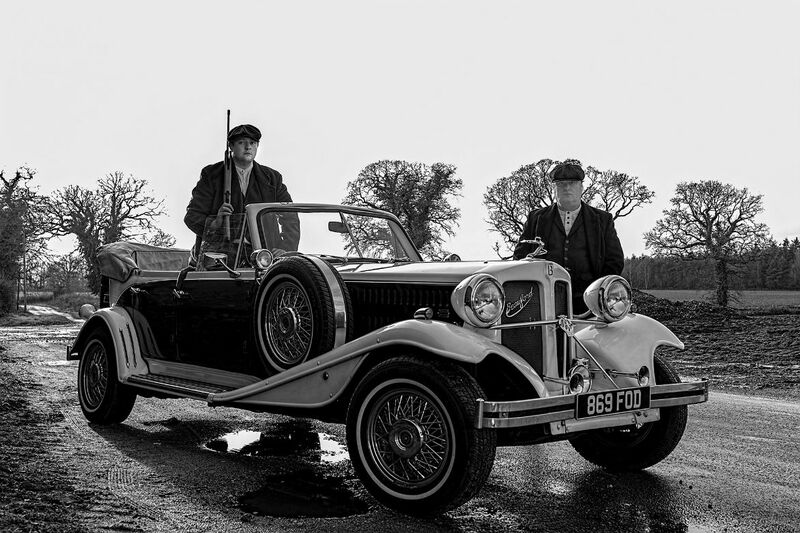 02 Jan When Silverline Limousines met Peaky Blinders ..
After watching and becoming fascinated by Peaky Blinders which has now become a cult TV programme we decided to commence the new year of 2018 by staging our own “PB” photo shoot tribute on New Years Day !! Peaky Blinders is a gangster family epic set in Birmingham England in 1919, just after the first world war the story centres on the Peaky Blinders gang and their ambitious and highly cunning boss Tommy Shelby and his family, Their distinctive mode of dress saw the members of this gang wearing a signature outfit of tailored jackets, depressed lapel overcoat, button vests, silk scarfs, bell – bottom trousers , leather boots, and peaked flat caps which had razor blades stitched in them. The history books show that the gang actually did exist but were nowhere near as powerful and glamorous as the TV series suggests, TV also suggests that the name “Peaky Blinders” came from the caps razor blade ability of blinding an enemy, this is proved to be doubtful as razor blades were only available late in the 19th century and were an expensive luxury item !!! So if you feel like you wish to have a “PB” themed wedding let us know … but remember our cars are available for any theme of wedding ?? ?